my home. It has been an incredible six months – our lives have completely changed. We are now living on the opposite side of the world on a tropical island and we are now a homeschooling family. The kids are no longer rushing to keep up with my schedule and the general facst paced life in North America. We are free to make any day a pj day (we are making up for lost time on this one), a beach day, a big outing to the zoo or just the local park. The weather is almost always the same here, so we just see how we feel – if we need more rest, then we take it. If we are up for adventure, we go for it! However, my expectations of free time for myself really have not happened like I had imagined. 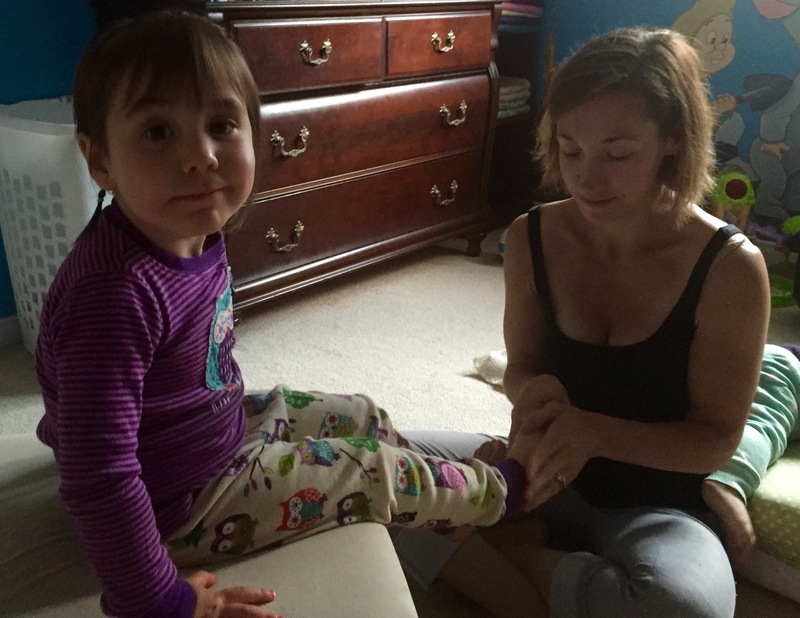 I had envisioned free evenings once the kids were asleep – no chores, no emails, no work. I had envisioned myself sewing the girls cute matching dresses and dolls (all of the materials I have here on hand – except a sewing machine – but I would have time to sew by hand, right?). Along with reading a long list of books that I have been wanting to read for years. I would also practice my piano each day, so that I would be playing like Alicia Keys. And don’t forget working out each day – I would train for a triathlon! For any of you who know me – you know that the above is not me being funny, I really believed this would ALL happen. Yes, within the first 6 months. Reality – I am usually so busy with chores, clean up from dinner and catching up with laundry that I don’t sit until 9:30pm. Then Everly typically wakes once around 10pm and I have to help her fall asleep. By that time, it is too late to begin a project, so I spend time online or Alan and I watch tv or part of a movie (which drives him crazy to stop part way through, lol). This past month, I have also had to add in planning for Christmas and Isla’s birthday. I am trying to find time to read in the afternoons with a hot coffee – but with 3 young children, I have read 5 chapters between 3 different books! I repaired a dress and a costume – but that is the extent of sewing. I have been more successful with working out and I do manage to swim regularly and I have recently began running and training at the gym. So, when did I fit in 30 hours of work a week, plus emails, schedules, and planning at night – on top of maintaining a household?! I don’t have a dishwasher and I have the tiniest washing machine in the world, but that does not add that much time. However, I do spend my days with my kids. We do some basic chores throughout the day, but I don’t spend my days cleaning. I am getting to enjoy a coffee in the afternoon and I have read more books to the kids than I have ever before. Our condo walls are full of art work, the floors are covered with lego projects, and the counters full with science experiments. Many of our days are spent exploring the city and all that it has to offer. And many days at the beach! I feel so very fortunate that we are on this adventure. I am also so grateful that I loved A Gym Tale for the 10 years that it was mine and my families way of life. I am also thankful that we were able to walk away from AGT when we felt the time had come. It is an incredible experience to be able to try living life in a completely new way. I am a firm believer that when a child is ready to learn a skill it will happen very quickly and smoothly. If forced before their readiness, it will be an uphill battle. turned 4 years old – he could not get enough paper to keep himself busy (we are lucky that we have many family members gathering scrap paper for Ewan). Whether it was creating paper objects (treadmills, glasses etc. ), drawing his own pictures and writing words or reading books. 2 years ago we began the All About Reading program (it has since made some changes that I am not yet familiar with). It appealed to me because the lessons were as long the child was interested – even 5 minutes was enough time to make some progress. The whole program is 20 lesssons – we are currently on 16. Sometimes we do it each day and other times we take a month or more break. But Ewan has retained every rule and sound combination that we have reviewed and his reading and confidence is incredible. To encourage more writing we have been writing letters to friends and family. I have also picked up some note books as Ewan really enjoyed writing stories last year at school. Ewan is now writing a ‘Pokedex’ Pokemon book with all new original pokemon that he has created along with the information on their health points, attacks and damage points. He is currently making a blog where he introduces his new pokemon to the world! You can have a sneak peak here, he has completed his About Me section. Ewan is not always eager to read and write. I try to pair his reading lesson with breakfast as we are all sitting at the table together. Before his spelling and writing skills had improved, I would also write down the descriptions of his pictures as the effort would turn him off of drawing. Another sure way to encourage reading and writing is for me to sit on the couch to read or to journal myself. It is only a matter of minutes before the kids also have their books and journals out and are busy at work. Read aloud chapter books or story books are never an issue, I think the kids could listen to books being read by Alan or I all day long! Recent stories have been Beatrix Potter and Curious George for Isla. We have read the Little House on the Prairie for both kids. Ewan and Alan have read the first 3 Harry Potter books (the next ones will wait until he is older). We are also spending a lot of time getting research and story books from the local library every second week. I am slowly learning to trust the kids own natural curiosity and try not to push through my own agenda. 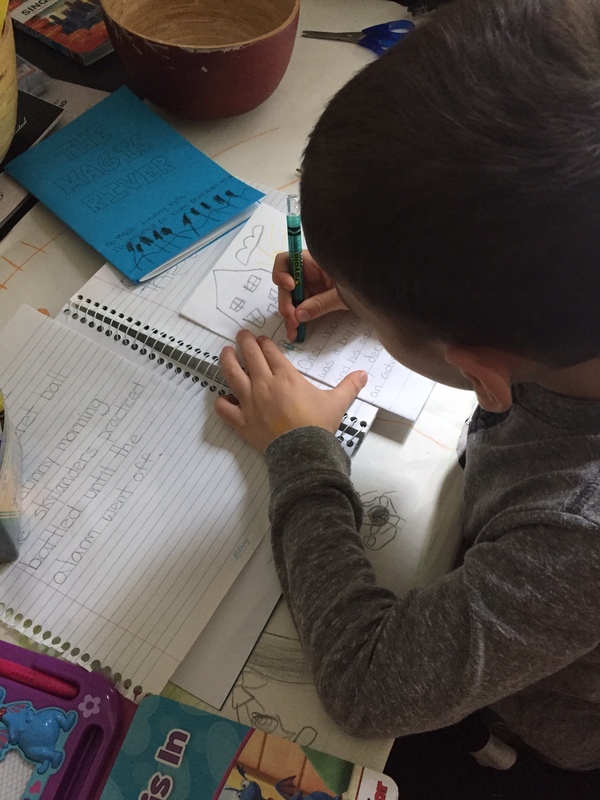 Although I do strategically leave out invitations that may be of interest to the them, such as envelopes, stamps and paper or new notebooks waiting to be filled, the kids will often come up with their own ideas. These ideas then usually take on a life of their own. 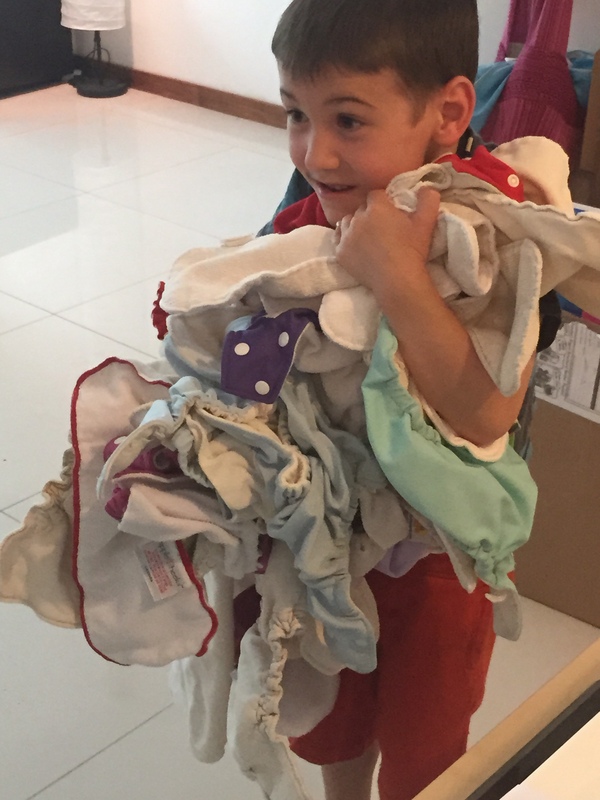 October was a bit of a whirlwind month as we had family visiting us in Singapore. I was so happy to have my mom and step dad here to see how we are living and to have them see the many amazing sights of Singapore. We were able to bring them to some of our favourite places – restaurants, the botanic gardens, the beach, the aquarium as well as our day to day activities – the pool, the library and the kids ballet and taekwondo classes. It was hard to have them leave and left us all a little homesick and feeling like our Christmas visit home was miles away. Coconut ice cream out of a coconut! I thought I would write about what our daily homeschooling rhythm looks like right now. We haven’t really had a first day of school as I try to keep our learning going each day. At my children’s ages there is not a lot of sit down “school time”. We are aiming at a middle ground between unschooling, having short lessons for reading and leaving invitations out for new learning opportunities. My goal is to incorporate reading, writing, math, science, art, and geography into the themes that the kids are currently interested in learning about. This may be in the form of outings, planned projects, books, or baskets of related activities simply left out in the play room. Right now it is space. Over the past two weeks we have worked on shapes, light, measurements, visited the science centre, went to a live talk in an omni-theatre on planets, created an outer space model, reading lots of books and a theatre show of “The Way back Home” by Oliver Jeffers. Ewan also loves Pokemon, so reading and math are worked into each game. He has also decided to write a Pokemon book! Isla is also enjoying learning about space. But she also very much enjoys art, dance and singing. She spends a lot of her days drawing, painting and cutting with dancing and singing in between projects. Reading is her other love and she will sit for hours to listen to stories or poems. The ‘structured’ activities that are done daily are a short reading lesson for Ewan from the program ‘All About Reading’ that lasts about 10 minutes. Reading poetry at breakfast and lunch (Toes in my Nose by Shiree Fitch is their favourite – they have actually memorized every poem in the book and still insist that we read it each day!). Reading a chapter from a chapter book – we have just finished Little House in Big Woods (Laura Ingalls) and we now play little house every day at the pool (another daily activity). Our current novel is Farmer Boy. Ewan also reads a chapter with Alan at bedtime and they are currently reading Harry Potter. Lots of reading!! We also work in piano once or twice a week and we incorporate speaking French over lunch time. Many of these structured activities I am trying to pair with a meal time so that they just become part of our daily routines. On an average day we begin with screen time (sky landers video game or a tv show) on their iPads from 6am-7am because I cannot get up before 7am while Everly still wakes during the night. From 7-8am we FaceTime family and friends. We then have breakfast between 8-9 (sometimes later). This is when we will have morning time learning – read the poetry, chat about some of our themed learning, work on memorizing an important fact (our new address, telephone number, months etc), talk about our day and end with Ewans reading lesson. Kids then clear their dishes and we read a chapter from their chapter book. We then get swim suits on and head to the pool from roughly 10-11am. When we get back we have our baths and showers for the day and then I prepare lunch. Over lunch we speak some french and read more poems or sometimes another chapter. Making rainbows as part of our science kit. After lunch, I will either put Everly down for her nap or we head out for an activity and Everly sleeps in the baby wrap. On the afternoons that we stay home, I try to have an activity for us to do. 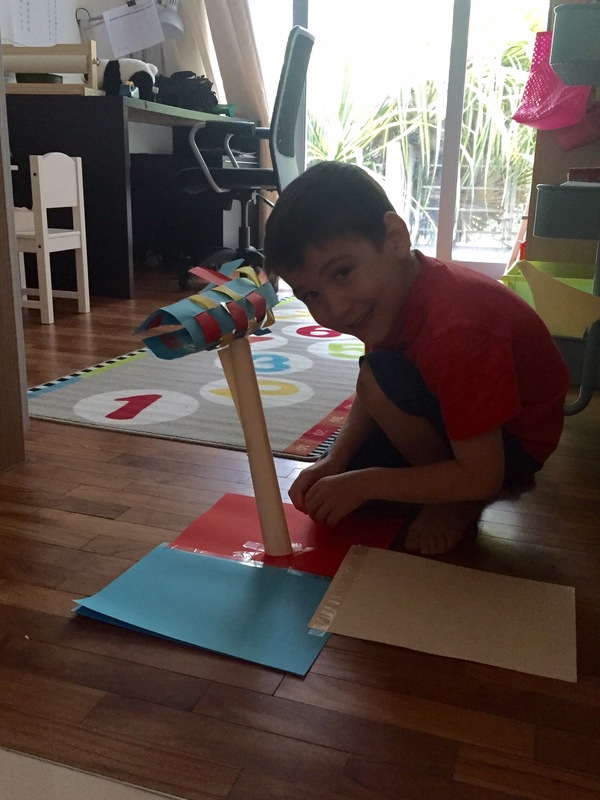 It could be a science experiment (we are loving the Magic Schoolbus Monthy subscription – they send a themed kit with everything needed for 7 experiments), art, writing, or whichever activity they feel like playing – lego and magformers are often taken out. Usually I will begin dinner around 4:30. If the kids are starting to lose it with each other at that point I usually put on a Sparkle Story – wonderful imaginative, listening stories that last about 20 minutes. Alan is usually home after that and can keep them busy. We aim for 7:30 bedtimes, so it is usually brushing teeth and pjs after dinner with a board game or a story. Alan has been taking off Wednesdays and we are using that day as our field trip day to explore the city. We try to choose trips where two adults are needed or full day events. So far we have went to the zoo, the bird park and a theatre show. Alan is away this week so we had a pyjama day today – sometimes those are good too! Above is a general outline of our days – I personally like to have a plan. But I am really trying to go with the flow as well. For example, this morning right after breakfast the kids really got into lego and had the entire living room floor covered with projects. I used the time to catch up on chores and laundry and we went swimming in the afternoon instead. There are also many, many, MANY meltdowns. Ewan has really been struggling with being homesick and not wanting to do anything. Once he is engaged he is loving each activity – but it has been a battle with each and every transition – even to go to the pool. Which is why I am trying to keep some activities linked to our basic daily routine (3 meals a day). Dumping crayons is also a favourite activity! This week has been much better – he has been more positive and enthusiastic and he is beginning to sleep better at night too. So hopefully we will continue in a positive direction. And if it isn’t Ewan then it is often Isla or Everly upset! We are still juggling with activities and finding ways to get everyone involved. Everly has recently found a love of colouring and not just eating crayons (although she did enjoy snacking on an orange crayon today). He loves the idea of writing books. 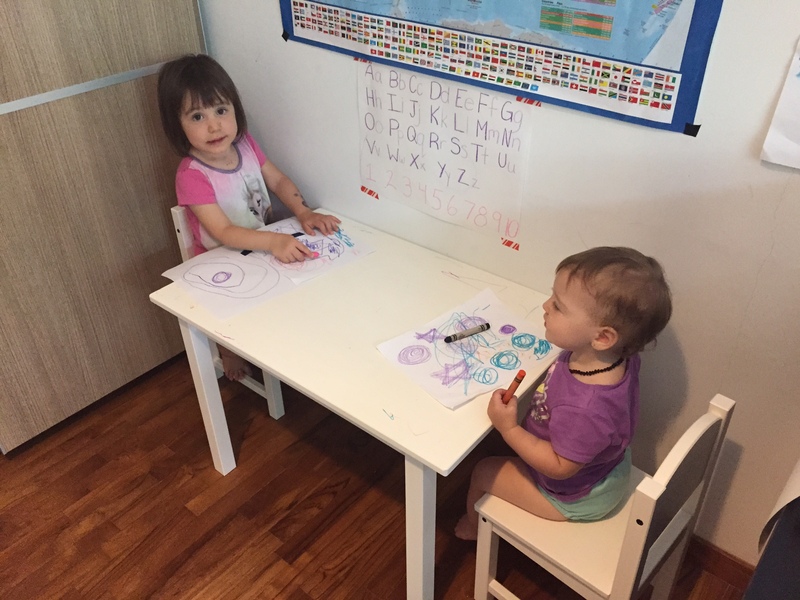 The girls will often sit at the table together and draw or have a tea party. West Coast Park – this is one of 5 playgrounds which are all side by side! The past two weeks we have been busy trying to orient ourselves and get to know the west coast of the city a little bit. I have become comfortable taking the bus to the local plaza which has a grocery store and it is where Isla is taking ballet and Ewan Taekwondo. We are also comfortable taking the bus to the local library as well as the science centre. This past week we have taken the MRT (subway) to a downtown appointment and it seems to be a really good way to travel further distances. The kids also now have bicycles so that we can get to the local park more easily. Our days and weeks are starting to move more smoothly and we feel like we have more freedom and choice in how we spend our days. And needing fruit and other basics from the store isn’t so terrifying! We have also brought the kids on a few day trips to help with being homesick. It is really nice that the local park is so amazing, so that we really do not have to go far if a quieter day is needed. Some of the adventures that we have taken are going to the Gardens by the Bay, which has an amazing view of the city from the tops of the super trees and then a great splash pad. The zoo was also a great experience. We now have a membership so that we can continue visiting the animals and using yet another amazing splash pad. Splash Pad at Gardens by the Bay – water is all timed to a disney sound track – lots of fun! The Zoo – we surprised the kids with a breakfast with the Orangutans! We spent the afternoon at the splash pad in the Zoo. We have also had the opportunity to meet several families with children of similar ages. The kids have loved running around wild with them and it has been really nice chatting with other moms about their experiences here in Singapore. It is so very hot! We are all adjusting very well. The first week was difficult for the kids and their behaviour was beyond challenging. But they are now sleeping better and they are getting more used to the heat and the long travels on the bus. We are also taking full advantage of the swimming pools. We are swimming between 1-2 hours a day! Over the next week, my goal is to begin trying some local food and to begin our homeschool daily and weekly routines to try and find our new normal. We left Ottawa last Monday at 5am to begin our journey to Singapore. This journey would take 30 hours! With three young children…. Our first flight was 5 hours from Ottawa to Vancouver. We were all very excited at this point. This flight ended up being the most stressful of the three. For the first two hours Everly kind of lost her mind because she couldn’t just walk around – so we walked up and down the aisle about 50 times. My stress levels were skyrocketing just imagining the next 28 hours! Then she finally went for her nap and slept the rest of the flight as did I. Ewan and Isla were very excited to watch as many movies or play as many iPad games as they wanted over the next 30 hours (normally they get about 30 minutes a day when Everly is going down for her nap – so this was a BIG deal). was incredible. I watched a movie, ate several meals and slept. I also lost all feeling in my legs. She then woke up for two hours where she ate and then we walked. Shockingly, she fell asleep for the last hour again! Ewan, Isla and Alan managed about 8 hours sleep and watched plenty of movies beforehand. We then had 3 hours in Hong Kong – and what a view! A gorgeous island with mountains all around. We were all pretty tired and cranky and the airport food left much to be desired. The last flight was 4 hours to Singapore. On this flight we did not want the kids to sleep as we would arrive in Singapore at midnight and we were hoping they would sleep a few hours that night to help with the transition of Singapore being 12 hours ahead of Ottawa. Ewan and Isla did stay awake but were really starting to lose it by the end of the flight. Everly on the other hand slept another three hours!! I knew this would be trouble but I also needed to sleep as exhaustion was setting in. 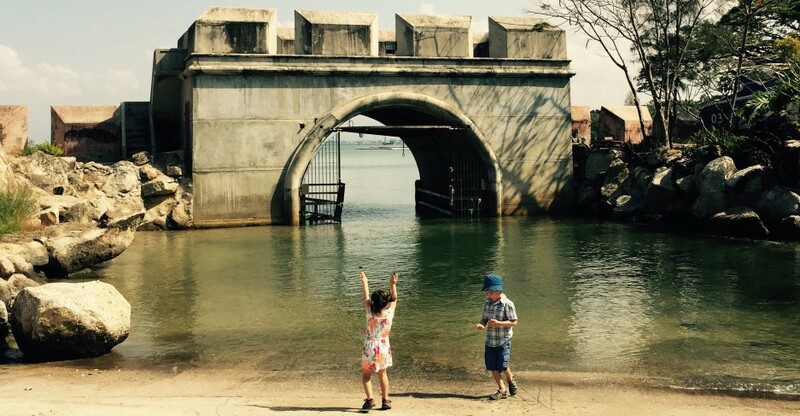 We finally made it to Singapore – the heat hit us like a brick wall – it is SO hot!! Even at midnight! We were very fortunate that two of Alans’ coworkers met us at the airport with a van for all of our luggage. They took us to our condo, they had filled it with groceries and made the beds and showed us around. This was so helpful and so very appreciated. The Ewan and Isla had fallen asleep on the way to the condo and we were able to put them directly into their beds. It was not surprising that Everly was wide awake! So we stayed up that night and unpacked all 11 suitcases (not possible to only have 8, so we used our maximum allowance of 11). I really wanted the condo to feel ‘homey’ and have the kids recognize their belongings when they woke up. The kids were very excited when they woke up at 7am and then Everly and I went to sleep until 2pm. Over the past five days we have been working on getting over jet lag and sleeping at the right times. Ewan is still struggling a little (getting up at 4am and going to bed at 5:30pm) but the rest of us are doing well. Dining and living area with entrance out onto patio (we are on the ground floor). The kids bedroom – with a wall closet on the wall when you walk into the room. The kids also have their special toys (toys Everly cannot have) behind their beds. Our bedroom with a dresser and wall closet and a bathroom attached. The office / play room / ‘school room’ – I also have an ikea kids table and chair set being delivered tomorrow for the room. A view of the balcony from the outside – there is a pond directly in front with turtles and all sorts of fish! The walkway to the park and recreational pool. The park in our complex. The 50m lap pool – this is just across from out balcony. From what we have seen, I am the only one using it! Singapore seems like a really lovely place. We are both excited and a little intimidated about learning the transit system so that we can start taking advantage of all of the experiences Singapore has to offer. The goal for this week is to get a bus pass and attend an art class, ballet class, soccer school and find the library. Wish us luck! As the countdown is now at 8 days until we leave, I have found a new interest to distract myself from packing. I have begun to learn about incorporating essential oils into our daily lives. I have always been interested in natural products to improve my families health and wellness and I now have the time to learn more about the many benefits and uses of these oils. They actually have so many uses from making your own cleaning products, massage oils, changing the household mood by diffusing the oils as well as boosting our immune systems. I really like idea of using the oils in our daily routines to help the flow of our days. Specifically, I would like to start working the oils into our afternoon and night time routines. In the afternoons, the kids and I often have our down time while Everly takes her nap. I have started using the lavender oil in the diffuser to help create a calmer and more relaxed feel while we read books or the kids find quiet activities. I am hopeful that this intentional act will help give myself and the kids some quiet time to make it through the rest of the day. At bedtime, I have started massaging the kids feet with a ‘peace and calm’ blend mixed with coconut oil that should help relax them into a good sleep. Our nights are not the most restful right now and we definitely need some help in this area. Ewan has trouble slowing down his mind to fall asleep and Isla struggles to stay asleep and Everly is just up all the time! The kids have really enjoyed taking their turns and getting some extra touching from mom at the end of the day while dad is reading the story books. I am excited to continue to test out new oils and blends to help energize my own moods in the morning and to help myself slow down in the evenings. I think using the oils will help everyone with the stress of the upcoming move. It will also be a good way to boost our immune systems and to help fight off colds and flu when symptoms first appear. And it will be nice creating one household cleaner that can do it all! If you are interested in incorporating these oils into your own daily life or simply to get more ideas on how to use them, join me on my page. Now to get back to packing – maybe there is an oil for that? !